With leap year only hitting our calendars once every four years, you might think there would be a dearth of dynamic leap day cards during the Mid-Atlantic Championship Wrestling era. But that wasn’t the case, and in fact, on February 29, 1976 there were TWO major cards both of which arguably had historical significance. Greenville, South Carolina received a special leap day treat, as the Memorial Auditorium hosted an extremely rare Sunday card on February 29, 1976. Monday was Greenville’s regular wrestling day. But on this Sunday star-studded leap day lineup, NWA World Tag Team Champions Gene and Ole Anderson battled to a wild double disqualification result with the charismatic team of the “American Dream” Dusty Rhodes and Rufus R. “Freight Train” Jones! Dusty was brought in as a special attraction from outside the Mid-Atlantic area for this bout. 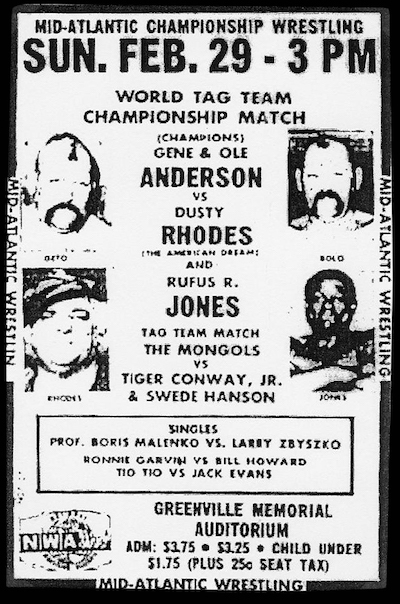 The fans in Greenville also got to see Geeto and Bolo Mongol dominate Tiger Conway and Swede Hanson, and the Mongol’s manager “Professor” Boris Malenko make an increasingly rare visit into the ring, dispatching the young but talented Larry Zbyszko. Rounding out the leap day card in Greenville, rough and tumble Ronnie Garvin whipped up on the crafty Bill Howard, while the curtain raiser saw Tio Tio draw with “Dynamite” Jack Evans. The second leap day card in 1976 occurred at none other than the cavernous Greensboro Coliseum in Greensboro, North Carolina. And it featured a spectacular main event, with NWA World’s Heavyweight Champion Terry Funk defending his prized belt against number one contender and reigning United States Heavyweight Champion, Paul Jones! At this point in time, Paul Jones was at the absolute zenith of his Mid-Atlantic career. Paul had beaten Terry Funk on November 27, 1975 in Greensboro for the U.S. belt, and widely proclaimed to the fans that he had Funk’s number. Jones was defending his U.S. Title impressively against the mammoth Blackjack Mulligan, and Paul’s popularity was through the roof. It appeared to many that Jones would ride his wave of staggering momentum to a World’s Title victory on this night. 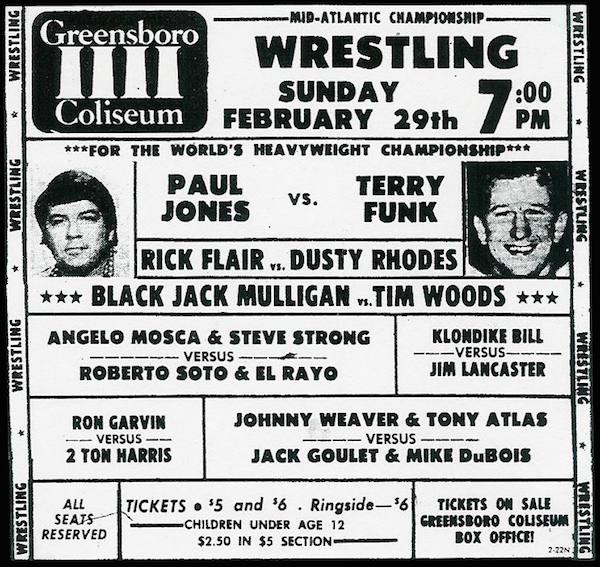 Alas, it was not to be as Terry Funk disappointed everybody in Greensboro with a pinfall victory. In my opinion, Paul Jones never recovered from this loss fully, as within two weeks he would drop the U.S. Title to Blackjack Mulligan. Paul was never again the number one contender to the World belt, and as tantalizingly close to the NWA World Title as he was that leap year’s night in Greensboro, though Jones certainly had his fair share of triumphs throughout the remainder of the Mid-Atlantic years. Despite the bitter disappointment of the Paul Jones defeat, the fans in Greensboro did have a lot to cheer about on this leap day, 1976. In the semi-final, they saw the skillful Tim Woods heap a rare defeat on the brutish Blackjack Mulligan. These two had been battling since around the time of the big U.S. Title Tournament in Greensboro on November 9, 1975, when Woods had cost Mulligan a chance to advance in that epic tournament. Dusty Rhodes continued his leap day “double shot” in the Mid-Atlantic area, dropping a disputed decision to the chicanery of Ric Flair, which of course silenced the fan’s cheers again for a bit. The undercard of this Greensboro leap day show was excellent, and was very fan friendly! The high-flying duo of Roberto Soto and El Rayo outlasted the powerhouse duo of Angelo Mosca and Steve Strong. A significant losing streak for Strong was continued by this bout. The impressive new duo of Mike “The Judge” DuBois and “Sergeant” Jacques Goulet battled to an entertaining time limit draw with Johnny Weaver and the powerful Tony Atlas. Ronnie Garvin completed his leap day “double shot” 2-0 with a win over the always obnoxious George “Two Ton” Harris. Klondike Bill opened the festivities with a decision over big Jim Lancaster. Yes, in 1976, Mid-Atlantic Championship Wrestling was the place to be on leap day! With leap day cards like that, it’s a shame there was a four year wait for the next leap year to roll back around!